HMH Books for Young Readers, 9780544104891, 224pp. When Perry ends up in Venice on a European tour with his band, Inchworm, he can’t resist a visit to Harry’s Bar, where Gobi told him she’d meet him someday. The last time he saw Gobi, five people were assassinated one crazy night in New York City. Well . . . Gobi shows up, and once again Perry is roped into a wild, nonstop thrill ride with a body count. Double crossings, kidnappings, CIA agents, arms dealers, boat chases in Venetian canals, and a shootout in the middle of a Santa Claus convention ensue. JOE SCHREIBER is the New York Times bestselling author of adult novels Death Troopers, Chasing the Dead, and Eat the Dark. His other novels for young people include, the critically acclaimed Au Revoir, Crazy European Chick, Perry's Killer Playlist, and Lenny Cyrus, School Virus. He lives in Pennsylvania with his wife and children. "The nonstop action, romantic intrigue, and everyteen haplessness on Perry's part remains an incendiary combination." "Just as the Bourne franchise gets better with each movie, so does this action/spy-thriller series. . . . A thrilling sequel that won't disappoint fans." 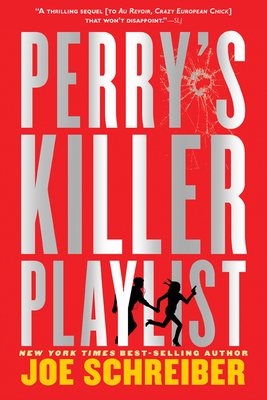 "Perry's Killer Playlist is an action-packed novel that moves very quickly. It's full of interesting characters who lead secret lives." "Hilarious, smart, the ultimate good guy, Perry is a reluctant James Bond caught up in another one of Gobi's La Femme Nikita-esque outa-control rollercoaster rides in this sequel to Au Revior, Crazy European Chick."